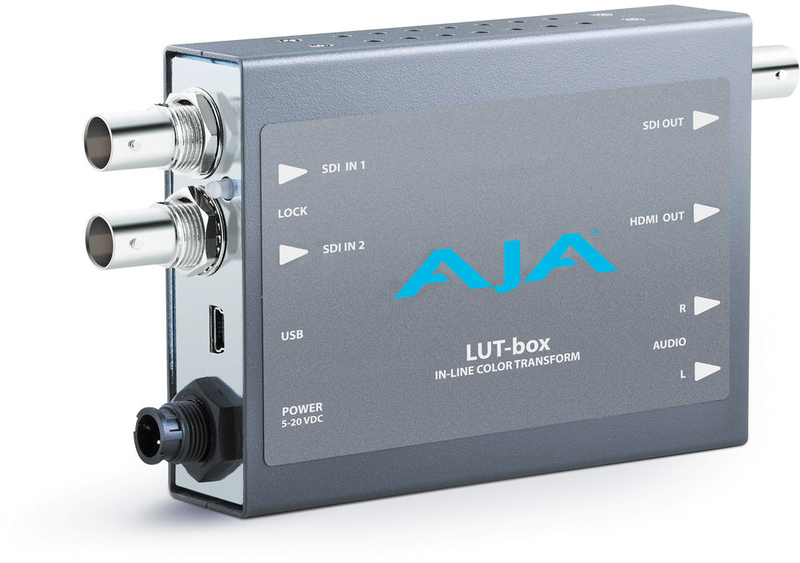 The AJA LUT-box provides an easy way to apply LUTs on-set for accurate color monitoring. AJA has announced new products to help optimize your workflows and integrate various signal types. The new converters consist of the FS1-X Frame Synchronizer & Converter, Hi5-Plus SDI to HDMI Mini-Converter, and HA5-Plus HDMI to SDI Mini-Converter. 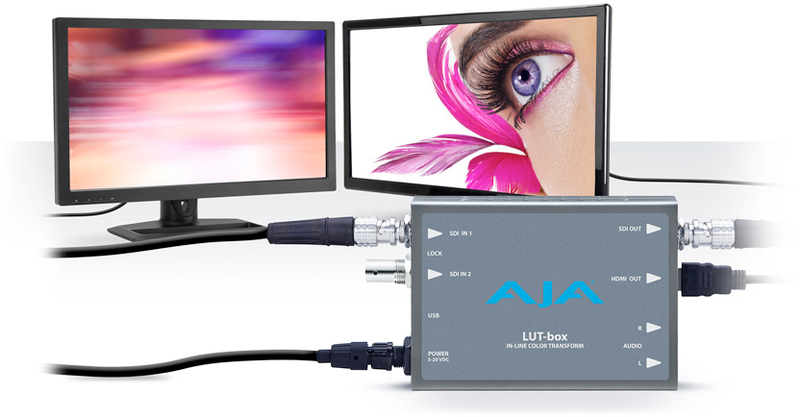 AJA has also announced their LUT-box, which provides an easy way to apply LUTs on-set for accurate color monitoring. Designed for broadcast, mobile, and post-production environments, the FS1-X is a compact, single rack-mount frame synchronizer and converter used to match up disparate audio and video formats. It incorporates a wide range of I/O connections for converting between analog and digital signals, with support for up-, down-, and cross-conversion between SD and HD signals. There is also an FS1-X model available with a Frame Rate Converter (FRC). Matching up and synchronizing disparate video and audio formats is a critical part of any broadcast, mobile or post-production environment. With the factory-installed motion adaptive FRC option, the FS1-X creates smooth, high-quality conversions between different frame rate families for virtually unlimited international standards support, including 1080p 50 to 59.94. The FS1-X provides workflow flexibility by offering a wide range of connections and video-format support. Video I/O connections include SD/HD/3G-SDI, optional SDI fiber, HDMI, Component, and Composite for support of all standard broadcast formats. A Reference In with Loop-Through is available for syncing. Audio connections consist of 16-channel AES audio, 8-channel analog audio, and 64-channel MADI audio over coax or fiber, as well as support of embedded SDI and HDMI audio. All outputs are active at the same time. The addition of support for the MADI standard allows users to work with and transport up to 64 audio channels along a single cable. The FS1-X supports both fiber or coax MADI input and output. An internal 224 x 224 audio matrix allows for full routing of MADI and all audio coming from SDI, SDI fiber, AES, and analog sources. "Another useful feature is the unique keyer configuration, letting you combine incoming signals." Another useful feature is the unique keyer configuration, letting you combine incoming signals. An example of how this can be used is when displaying 4:3 SD images on a 16:9 screen. Instead of stretching the image to fit the screen, a secondary signal, such as a company logo, can be used to fill side of the frame. The Active Format Detection (AFD) features of the FS1-X ensure that the aspect ratio of the outgoing signal is properly identified for downstream devices. The FS1-X is network ready and supports SNMP monitoring and LAN control via its Gigabit Ethernet port. When connected to your network, you can control and configure one or multiple FS1-X units from any web browser on a network-connected computer. Settings can be saved and applied across multiple units to ensure consistency and faster configuration in larger installs. For added signal security, dual redundant power supplies ensure the device remains online in the event of a power supply failure. 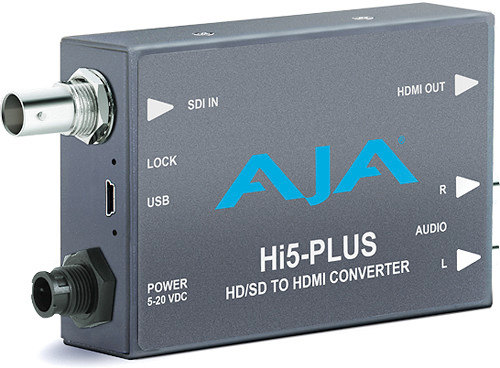 AJA’s powerful and portable mini-converters help streamline broadcast and post-production workflows. The Hi5-Plus is an SDI to HDMI converter capable of handling up to 12-bit SD/HD/3G-SDI input signals and outputting 30- and 36-bit Deep Color to compatible HDMI monitors. It supports resolutions up to 2K 2048 x 1080p at 60fps. Up to 8 of the 16 channels of embedded SDI audio and can be selected and passed to the HDMI output with the ability to delay the audio from 0 to 7 frames for proper synchronization with the output video. Two channels of RCA analog audio output are also available for easy external monitoring. The Hi5-Plus also adds the ability to convert from PsF to Progressive signals. This lets you integrate HDMI monitors, which don’t natively support PsF signals, into PsF workflows. A new USB connection allows for configuration via AJA MiniConfig software for Mac or Windows PC. A power supply and USB cable comes included. The HA5-Plus works in the other direction of the Hi5-Plus, converting HDMI signals to SD/HD/3G-SDI up to 1080p60 4:2:2 10-bit. Up to 8 channels of HDMI audio and/or 2-channel RCA audio can be passed through and embedded into the SDI output. The unit accepts progressive standard-definition signals at 480p and 576p for compatibility with many DSLR cameras. 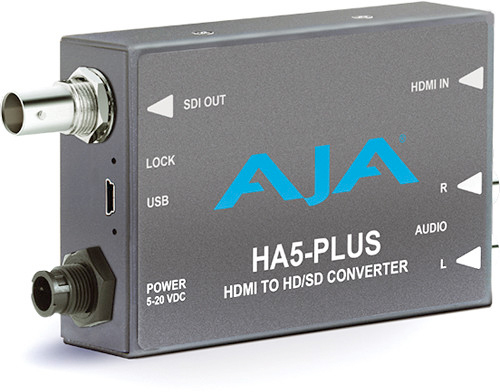 Like the Hi5-Plus, the HA5-Plus can be configured and controlled on a Mac or Windows PC over USB using AJA MiniConfig software. A USB cable and power supply are included. With more cameras using Log color profiles to preserve dynamic range and allow more flexibility in post-production color grading, it has become increasingly difficult to know what the final images will look like on set. This is where AJA’s new LUT-box comes in. Whether working with Sony S-Log, Canon C-Log, or other log-based formats, the mini-converter lets you upload 3D LUTs at up to 17 x 17 x 17 points with 12-bit processing to more accurately display the look of your final images while monitoring on set. LUTs are uploaded using integrated USB connection and MiniConfig software for Mac or Windows. It supports standard .lut, .txt, .3dl, and .cube 3D LUT formats. The LUT-box features two SDI inputs, which support 3G and Dual Link formats up to 2K 2048 x 1080p at 60fps. Simultaneously active 3G-SDI and HDMI outputs let you monitor your footage on HDMI and/or SDI monitors. Up to 16-channels of embedded SDI input audio can be passed to the SDI output, with up to 8 selectable embedded in the HDMI output. Similar to the other mini-converters, two channels of analog RCA audio output allow direct external monitoring. A power supply and USB cable are included.